Bill Danby: "Nice camera you got there, Buddy." None of this is about a lack of good will. Everyone has been very kind to me, and we are all just trying to make sense of what we find on the web. I'm grateful for all the comments that fellow forum users have made over the years. I've learnt a lot. 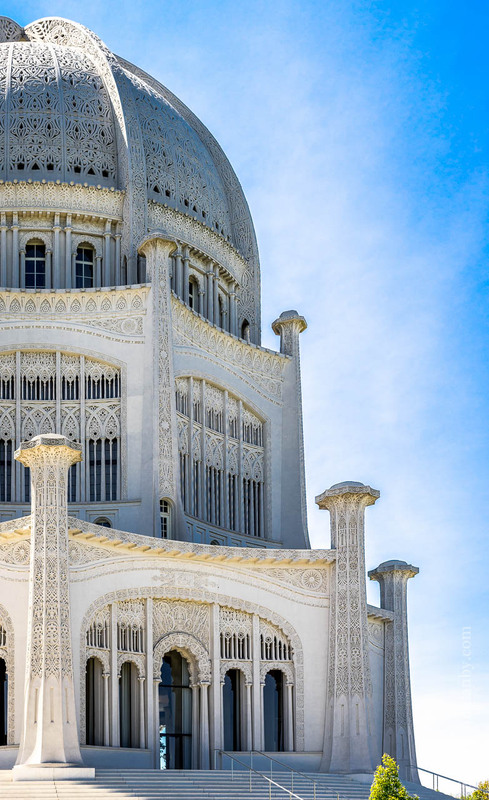 I've used both of the images shown in this post on the blog before — the Bahá'í Temple from the post that precedes this one, and the Bookseller from a post in April of last year. 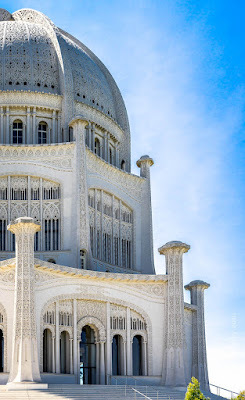 I put the The Bahá'í Temple picture on a forum, and I had a very kind comment about the image with a remark that it was a "very sharp lens!" I was surprised at the mention of sharpness because the web image is only about 1 megapixel (783 x 1280 pixels). There is no way of judging the sharpness of a modern lens by a 1 megapixel image. There isn't enough space (or interest, I'm guessing) for an in-depth discussion of acutance. But in the case of the temple, because there is so much contrasty scroll work, the viewer's eye immediately recognises that detail, making it appear sharper than it really is. I wasn't thinking about how "sharp" that scroll work would appear when I took the shot, but I did know what it meant when I went to do input sharpening in Lightroom. And, when I downsampled it to an sRGB jpeg at 1280 pixels vertically, I knew it would be a good screen match. Another commenter felt that the Bookseller image demonstrated Zeiss "pop." 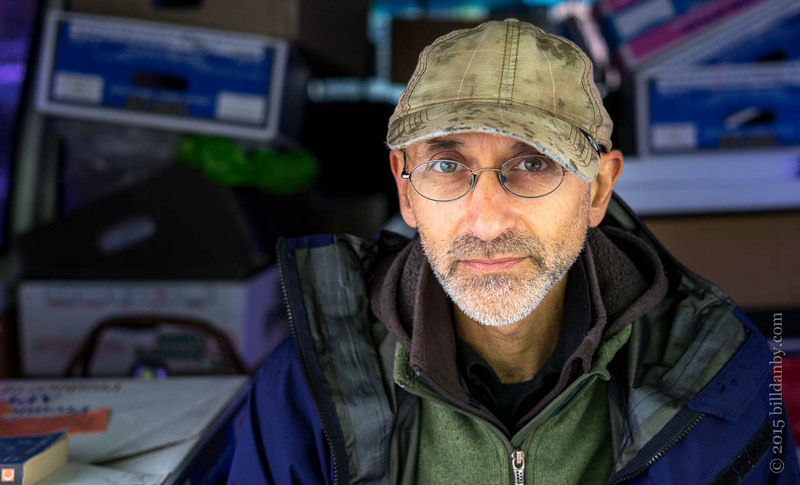 The Loxia does exhibit a bit of its own "pop;" but the photo has "pop" because the subject was surrounded by white plastic that brought in soft light for his face (it had begun to rain at the market) contrasted by the muted colours of his sweater, jacket and hat, and the plane of focus caught his glasses, his pupils and his beard. Both photos were made using the Loxia and a Sony A7II. Both were shot in good light (see the settings), and neither was heavily cropped. I love the Loxia and I know what it can do, but I believe that I could have taken either picture with similar web-display results with my loved, 10.1mp (but now long gone) Panasonic LX3 from 2008. Neither image, on the other hand, could be printed effectively without the qualities that I expect from the Loxia and the A7II. Most displays are very low resolution and are working hard to address the whole of the sRGB color space. And, in any case, most images on blogs, websites, and in on-line galleries (including my own) are low resolution. (We keep them low-res to avoid having them stolen.) And, those images will not be made higher resolution by being viewed on a higher resolution display (such as an Apple Retina). And, most images on the web are in the sRGB color space. Their color gamuts will not be expanded by being viewed on a wide-gamut display. Of course, the simple answer to the comment, "Nice camera you got there, Buddy," is, "Yup." I've had couple of images lifted, but I was able to get them taken down when the "publisher" learned that I was unhappy about it. In my gallery, however, I also prevent right-click downloads. I suppose that the remedies will depend on where you are and where the infringer is. If the infringer is in the USA, you can explore the "take down" provisions of the Digital Millennium Copyright Act (DMCA). This presumes, of course, that you know about it. I haven't noticed any of my text being plagiarised. Occasionally I use Google image searching to see if my images have migrated.